200+ pages of joint-making goodness! This book covers the five most important categories of joints and the various ways to make them. Please note that ordering from our website directly is a great way to support us. You’ll pay full price but you’ll get an autographed copy and our eternal thanks. If you want the best price and no autograph, you’ll want to buy the book on Amazon. International orders are welcome but we cannot be held responsible for shipping difficulties after the book leaves US soil. 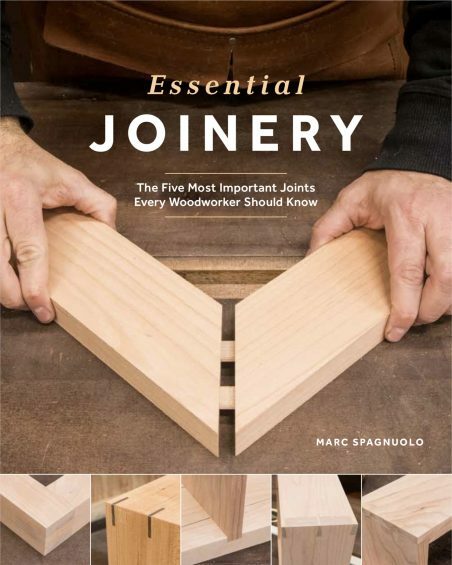 Essential Joinery is my take on the five most important joints you need to know for fine woodworking. These five “joints” are actually five categories of joints and the book goes into detail on the common variants within. Instead of a brief look at every joint known to man, I decided to apply a laser focus to the most common and most useful joints in woodworking. This allowed me to use large photos and step by step instructions to demonstrate each process thoroughly while also showing helpful tips and tricks such as how to fix common mistakes. I want this book to serve as the “missing manual” for joinery. A book that fills in the gaps left behind by existing publications (pun intended). The subject matter of Essential Joinery is very beginner-friendly but I suspect even experienced woodworkers will have something to gain. Published by Spring House Press.